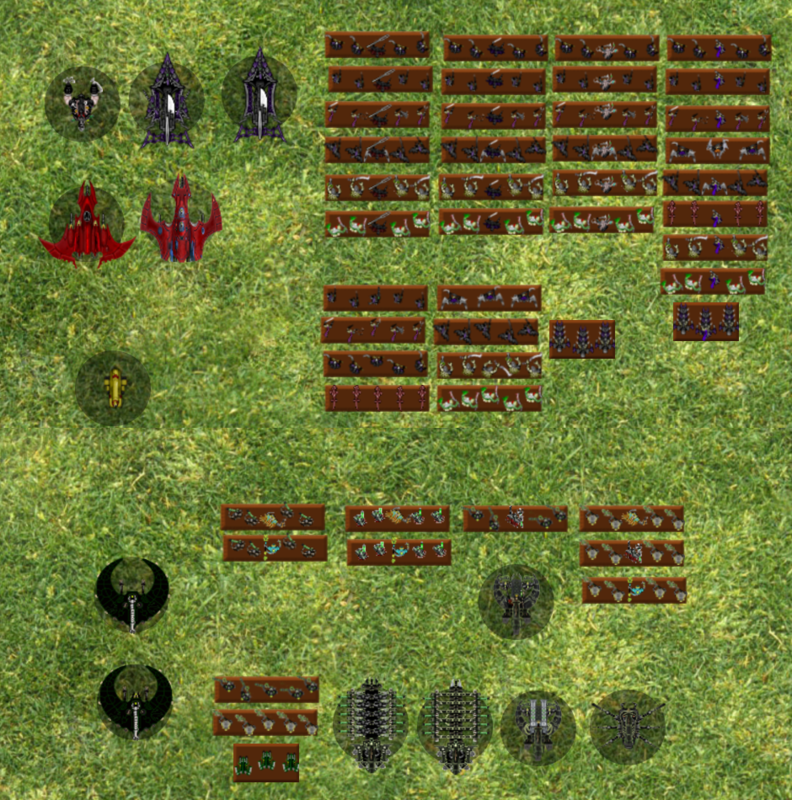 For anyone interested, I've made a heap of Dark Eldar sprites for use with Vassal. Message me if interested and we'll work out how to send you the file. The new stuff is in the upper half of this lot. Much of it is character options- whether by intention or not, most DE characters can go with most DE units, so I included every option I could see. Played with them tonight geep! Thanks mate! Dey is fantastic! Good work! I would like to get back into playing Vassal sometime. Can you include the couple of additional units in the Epic-UK Dark Eldar list please if you haven't already? That would be the Venom (smaller 5 man transport) and the larger Ogryn sized grotesques stand. Grotesques should be in there- in the 2 columns, 4 rows of the centre group they're the second column, third down. Is size an issue? Do I need to make some on the 40x20 bases or something? A link to the download is on the main Epic Armageddon thread. Thanks! No rush obviously and I understand you do this in your free time (I spent a few dozen hours making sprites for the similar Tabletop online epic game years ago though that never really took off in the end sadly) but I'm particularly interested in trying Dark Eldar on Vassal as it's a rare army I don't have models for in real life. The situation with Groteqsues is a little confusing. Originally grotesques in 40k were human sized zombie-things, then the newer version of the Dark Eldar Codex came out and re-named these human-sized ones Wracks and added new models for Ogryn sized zombie-things which now took the name Grotesques instead. The old Net-EA list just had the human-sized infantry version, but the Epic-UK DE Codex matches the more modern 40k codex and has both the human sized version and the ogryn sized version and if you could include them both (if you haven't already) that would be great. I don't mind what base size you put the larger ones on, probably whatever size units for similar size creatures such as ogryns are on. Thanks for the information. I'll see what I can do about Ogryn-sized Grotesques. They'd probably still be on 10x40 bases, which I think is right for Ogryns, but I may exaggerate their size and have just 3 to a base or something (just to make the difference obvious). Geep is correct. The Ogryn Sprite is still prototyped using the 40x20 base, irrespective of unit pictures. That being said, perhaps we should switch it to the 40x30 one? That's what we use for things like bikes and Rough Riders and the like? It does have a gameplay impact as you can't string them out quite as far but I suspect it's minimal in practice. Thoughts folks? Geep, I'd suggest we keep the current unit as is and rename it to Wracks and then create the biggerized one for Grotesques. Agreed? Sure- I assume the renaming wont bother the NetEA people too much. I don't think I've ever looked at the current Ogryn sprite. Slightly off topic for this thread, but the '40x30' base in Vassal is actually a 40x20 base- just in case the thought of that confused anyone. Send me the link to download the sprites file. I have tried to work out how to play Vassal, even looked on the you-tube for tips and tutorials, but some of it still stumps me. I will keep trying to work out the process off loading up the Module, and logging into it, selecting and loading a map, working out the set-up area, inserting in the list for the army, and then placing all the relevant sprites onto the map, Naming them, and then form there move units with the orders shortcut keys (still have to learn these). Having problems making sure all this happens (This is what I understand is roughly the order things get done), as I can not get many of the things to happen correctly, and it takes forever to do anything. I will persist, and maybe succeed. I would suggest that you actually start with one of the many maps that Apoc or Chroma have put together. They are an empty save game file with a populated terrain table that allows​ you to just straight to putting unit's out. You'll want to audio chat with your opponent over Skype (or similar) and a more familiar player could probably help you out getting used to it Deb. A Vassal game might take 2-3 times as long to play through as a real life game though, which isn't ideal, but I still see it as worth it to play games and people you never would otherwise. Yeah as I describe it to people, "It's utterly simple and completely not intuitive". Being walked through the first time with a voice call (skype is free for example) is a real need. I don't have time to play a game at this moment but I probably could set up a walkthough, mate.